first, sorry for my bad written english. and now my problem: I use Fhem Homeautomation Server. On My AnetA8 Mod with Marlin 1.1.8 woks Uptodate Octoprint on RPI 3+. 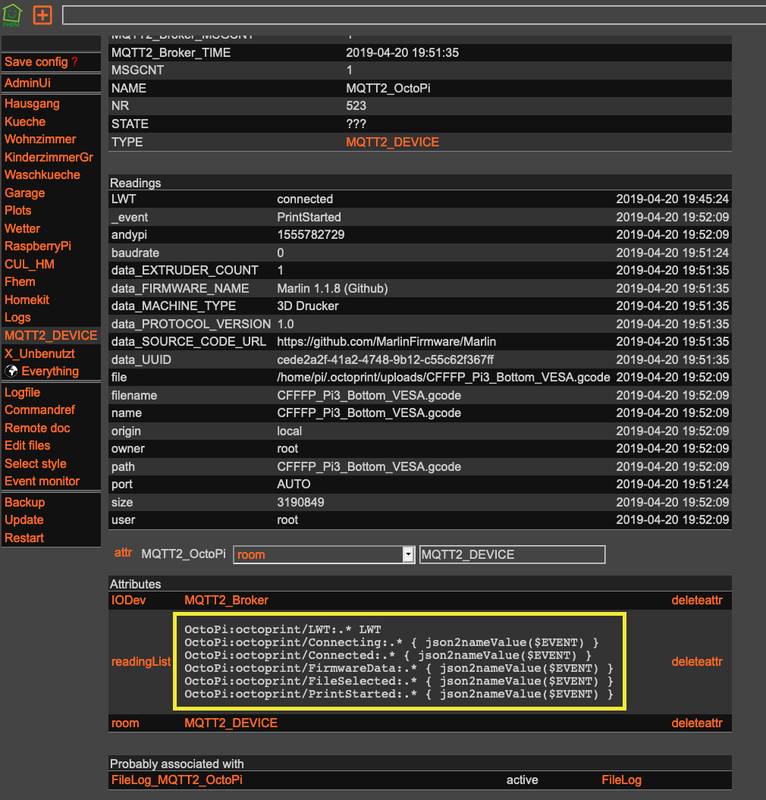 I use the MQTT plugin for Octoprint and MQTT2 on Fhem. In Fhem is an option to "autocreat" Mqtt Devices. This Works very fine, but only Octoprint creat on every Startup (boot /reboot) a new Device with a random "client_id". 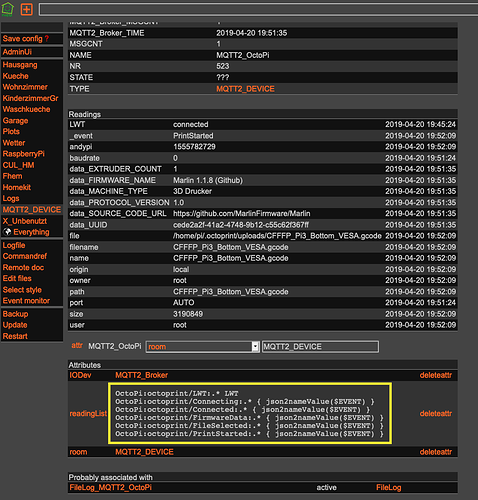 at the footer of the mqtt-dokumentation i read, " OctoPrint-MQTT uses the Eclipse Paho Python Client under the hood,"
the unique client id string used when connecting to the broker. If client_id is zero length or None , then one will be randomly generated. In this case the clean_session parameter must be True ." is it possible to edit this in one config file? Yes. If that's what the instructions say to do, the copy one of the ones that got generated from before and fill in that client id. Let us know how it works out. I do not understand, what do I have to edit where? in which directories do I have to edit which files? 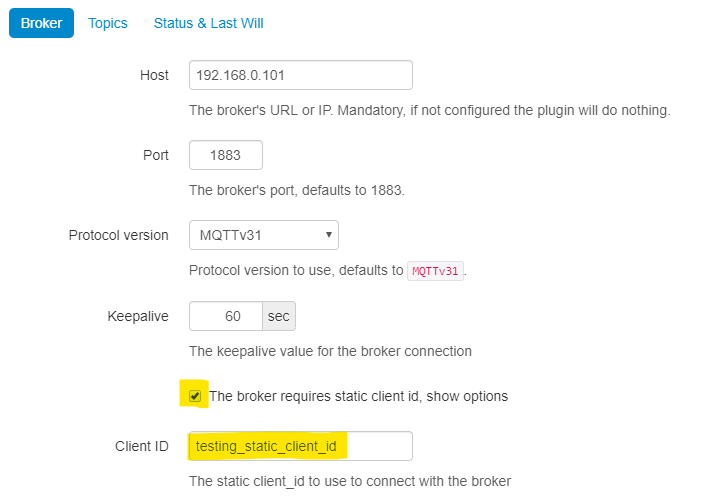 @kurtnelle, there isn't a way to statically assign a clientid in the MQTT plugin. You can set a username/password but I don't think this is the same thing that @DasQ is running into. I've added a feature request to the MQTT repo for this. thanks a lot, that`s what i need. You needed a change request. That's kinda sad. I would think having the need to have a static client id would have come up by now. The MQTT plugin was one of the many that recently got transferred to other developers (including myself) by foosel because she knew they were not getting the attention they deserve. I've been real busy with work and have a backlog of my own plugin issues that need some attention, so I get it. If I'm able to, I'll look into this request over the weekend to see how hard it will be to implement. If it's not too difficult I'll submit a PR for review by the other team members once completed, and potentially get you guys to test prior to submitting if that's ok since I don't have the same MQTT restrictions as you guys. Incorporated into branch 1.8.2 for testing. Install using the following url in plugin manager to verify it's working for you please. If everything looks good on your end I'll release an official version. do i have first, something to configure? 2019-04-20 10:22:21,848 - octoprint.filemanager.storage - INFO - ... file metadata for /home/pi/.octoprint/uploads initialized successfully. 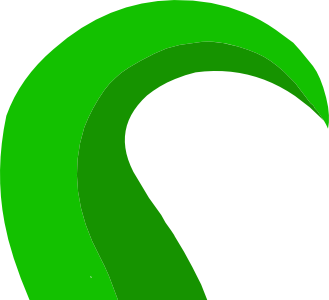 2019-04-20 10:22:28,909 - octoprint.server.util.watchdog - INFO - ... initial scan done. 2019-04-20 10:22:28,965 - octoprint.plugins.pi_support - WARNING - This Raspberry Pi is reporting problems that might lead to bad performance or errors caused by overheating or insufficient power. !!! UNDERVOLTAGE REPORTED !!! Make sure that the power supply and power cable are capable of supplying enough voltage and current to your Pi. 2019-04-20 10:30:20,963 - octoprint.util.comm - INFO - Changing monitoring state from "Offline" to "Detecting serial port"
2019-04-20 10:30:21,139 - octoprint.util.comm - INFO - Changing monitoring state from "Detecting serial port" to "Opening serial port"
2019-04-20 10:30:21,142 - octoprint.util.comm - INFO - Changing monitoring state from "Opening serial port" to "Detecting baudrate"
2019-04-20 10:30:22,180 - octoprint.util.comm - INFO - Changing monitoring state from "Detecting baudrate" to "Operational"
2019-04-20 10:30:24,816 - octoprint.util.comm - INFO - Printer reports firmware name "Marlin 1.1.8 (Github)"
2019-04-20 10:33:03,532 - octoprint.server - INFO - Goodbye! 2019-04-20 10:33:23,341 - octoprint.filemanager.storage - INFO - ... file metadata for /home/pi/.octoprint/uploads initialized successfully. 2019-04-20 10:33:28,958 - octoprint.server.util.watchdog - INFO - ... initial scan done. 2019-04-20 10:33:29,016 - octoprint.plugins.pi_support - WARNING - This Raspberry Pi is reporting problems that might lead to bad performance or errors caused by overheating or insufficient power. Yes, in the settings change enable the option and set your client_id. Once set, restart octoprint. shame on me. in german we said "den Wald vor lauter Bäume nicht gesehn" "did not see the forest for the trees"
It Works very Fine !! !